The method you choose for starting your lawn can influence its appearance, health, and maintenance requirements for seasons to come. Both sod and hydroseeding can produce a beautiful lawn, but each method has its pros and cons. When you buy sod, you’re paying for all the materials and labor that went into growing established grass. That includes seeds, water, and fertilizer as well as the work of planting and harvesting. All this makes sod the most expensive way to start a lawn. Hydroseeding costs around 70 percent less than sod. With hydroseeding, you’re buying a mixture containing seeds, fertilizer, mulch, and binding material that will be sprayed onto the ground. You then invest your own labor into tending the grass as it sprouts and becomes established. That cuts down on the overall costs. Sod is typically grown using a single species of common turf grass seed, such as tall fescue, Kentucky blue or hybrid Bermuda. If you opt for sod, you’ll need to decide which species is best for your lawn. With hydroseeding, however, you can choose to mix several species based on factors such as color or environmental friendliness. 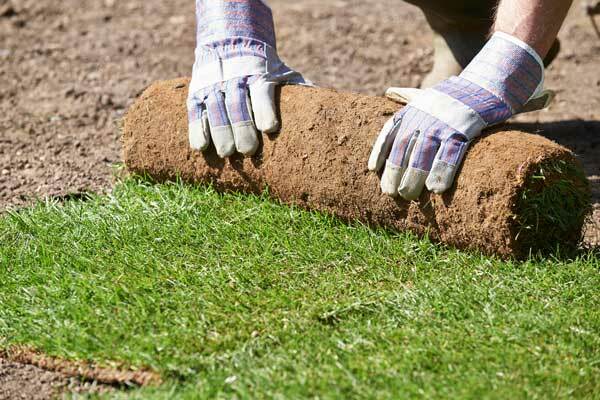 You can install sod by yourself or hire a contractor. It’s possible to lay sod any time of year, although late spring or late summer are ideal times. Hydroseeding must be done by a contractor with a truck designed to spray the mixture onto the ground. Anytime from March to October is acceptable, but the hotter the weather, the more you’ll need to water the soil. The right sod can give you an instant lawn. The grass in sod is developed and strong enough that it won’t die if you forget to water it. On the downside, you could end up with sod that’s incompatible with the soil on your property. In this case, the grass’ roots will reject the soil and the grass will fail to take root. Hydroseeded grass usually becomes established enough to mow within four to six weeks after application. After three months, the grass is strong enough you can let your kids play on it. It’s possible for hydroseed mixture not to take root, but it’s highly unlikely this will happen. Hydroseed mixture needs larger amounts of water than sod and should be watered on a relatively strict schedule. In hot weather, you may have to water it multiple times a day for up to eight weeks. Sod is prone to weakness and health problems because the roots of the grass are cut off during harvesting. This stresses the grass and exposes the roots to disease. That means even if the sod takes root in your soil, it can still turn out to be unhealthy. Hydroseeding allows the grass’ roots to remain undisturbed and protected from disease after they begin to grow, which increases the chance you’ll have healthy grass. Uneven distribution of the grass is another problem with sod. A lawn with newly laid sod may look seamless, but within the first few months the sheets of sod are liable to shrink. This leaves visible gaps in your lawn that are difficult to correct. The risk of this occurring can be limited by hiring a professional to install your sod and watering the sod as recommended for the time of year. Hydroseeding distributes an even layer of seed mixture. The seeds put down roots where they land, so there’s no risk they grass will shift later. If you’re not in a hurry, hydroseeding is a convenient, budget-friendly way to grow a healthy lawn. On the other hand, if you hate the look of bare ground, you don’t mind paying more for an instant lawn, and you’re comfortable with the risk of imperfections, sod could be the right choice for you.